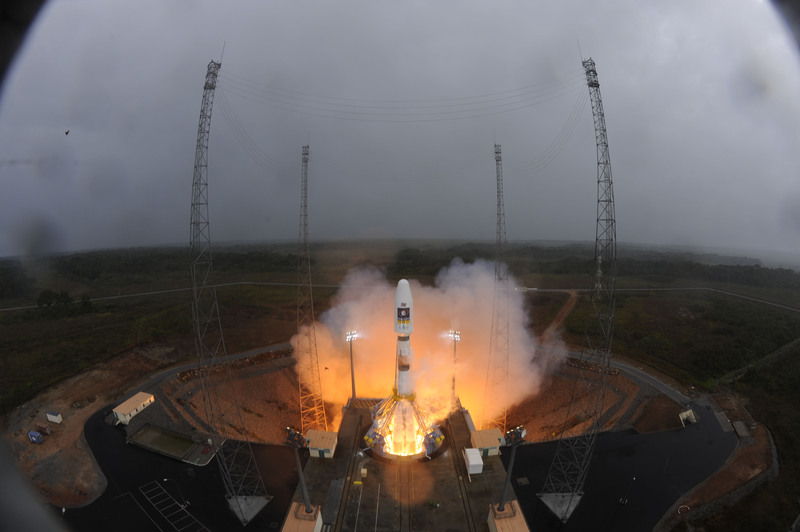 On Friday, October 21, at 7:30 am local time (10:30 UT), Arianespace successfully launched the first Soyuz rocket from the Guiana Space Center (CSG) in French Guiana, orbiting the first two satellites in the Galileo constellation. This historic launch signals the advent of the world’s broadest range of commercial launch services, and will ensure Europe’s independence in satellite positioning and navigation services. The “Soyuz at CSG” program carries on the partnership between Europe and Russia that started in 1996 with the creation of the Starsem joint venture to operate Soyuz commercial launches from the Baikonur Cosmodrome in Kazakhstan. It gives Europe access to a proven medium launch vehicle, while allowing Russia to increase its annual production of Soyuz launchers. With Ariane 5, Soyuz and shortly the Vega light launcher, Arianespace is the only launch services company in the world capable of launching all types of payloads to all orbits, including communications, scientific and Earth observation satellites, constellations, cargo missions to the International Space Station and more. Galileo effectively started in 2005 and 2007 with Starsem’s launch of Soyuz rockets carrying the first two testbed satellites, Giove-1 and Giove-2 (Galileo In-Orbit Validation Element). Since then, the European Commission and the European Space Agency (ESA) have ordered 18 Galileo satellites from the European space industry, to be launched by Arianespace using Ariane 5 and Soyuz rockets. Galileo gives Europe its own satellite positioning and navigation system, supporting a large number of applications. Once the system is fully operational, it will generate significant economic benefits, and greatly improve the quality of life for European citizens. The Soyuz launcher lifted off from the Soyuz Launch Complex (ELS) at the Guiana Space Center (CSG) in French Guiana. Liftoff was on Friday, October 21 at 7:30:26 local time in Kourou (10:30:26 UT, 12:30:26 pm in Paris, 6:30:26 am in Washington, D.C., and 2:30:26 in Moscow). The Galileo IOV-1 satellites were built for ESA by a consortium led by Astrium GmbH of Germany. They were injected into an intermediate circular orbit at an inclination of 54.7 degrees. The mission, from liftoff to satellite separation, lasted 3 hours, 49 minutes and 27 seconds. The European Space Agency developed the Soyuz at CSG (Guiana Space Center) program to bolster collaboration with Russia on launch vehicles. Program responsibilities are distributed as follows: – ESA is the program manager, and provides the Soyuz launch complex (ELS) to Arianespace. – Russian space agency Roscosmos is in charge of the Russian segment of the program, and coordinates the work of all Russian companies involved. – French space agency CNES is system architect for the Soyuz at CSG program, and the design authority for all facilities at the space center. – Arianespace manages the supply of Russian systems and coordinates and supports the work of Russian companies during the development phase. It is in charge of operating Soyuz missions during the operational phase. Galileo is a European program designed to develop a new global satellite navigation system under civilian control, offering a high-precision, guaranteed positioning service. The design, development and in-orbit validation (IOV) phases of the Galileo program were carried out by ESA, with joint funding by ESA and the European Commission. The Full Operational Capacity (FOC) phase is managed and wholly financed by the European Commission. The Commission and ESA have signed a delegation agreement under the terms of which ESA acts as design and procurement agent on behalf of the Commission.